Gov. 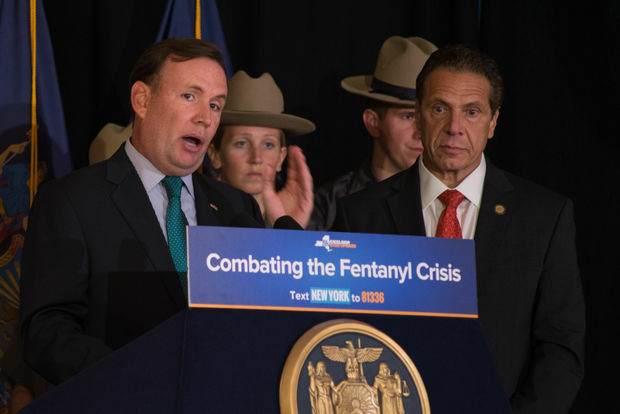 Andrew Cuomo (right) joined Assemblyman Michael Cusick and State Sen. Andrew Lanza to announce support for a new bill that would categorize different variations of fentanyl as controlled substances locally. PLEASANT PLAINS — Gov. Andrew Cuomo on Thursday announced his support for a plan to close a loophole that allows drug dealers to stay a step ahead of law enforcement as they tweak the formula to a deadly synthetic opioid to avoid harsher sentencing. New legislation in Albany aims to close the loophole by adding the different configurations of the drug to the state's controlled substance list and make it easier to add new ones on in the future. "They add a chemical and now it's different than the legal definition, so now it's no longer an illegal substance," Cuomo said at a Staten Island press conference where announced a package of bills to be sponsored by State Sen. Andrew Lanza and Assemblyman Michael Cusick. "We find that new compound and we put that in the law. They go back to the lab and they come up with another compound and it's a game of whack-a-mole." The bill would cover 11 different fentanyl compounds, called analogs, that are already on the federal controlled substances list to the state's as a Category I — the strictest classification — which would make it easier for law enforcement agencies to crack down on the drug, Cuomo said. It would also give the state Department of Health commissioner the power to add any drugs in the future to the local list that already appear on the federal list. "Fentanyl is to heroin what bump stocks are to rifles," said Lanza. "We need to stop it right now." Fentanyl, a synthetic opioid 100 times more powerful than morphine, is traditionally used as a painkiller for extreme cases like end-of-life cancer patients. Dealers started to add the drug to heroin to increase profits and potency, but the drug requires a much smaller amount to overdose on and officials blamed it for the sharp rise in overdose deaths in the past two years. From 2015 through 2016, Staten Island had a 700 percent increase in the number of deaths linked to fentanyl, the highest in the state, Cuomo said. While straight fentanyl is already on the state list as a Schedule II controlled substance, dealers change the chemical compound in labs to make a different analog not subjected to the same criminal penalties, which could sometimes be more potent. Fentanyl also requires more doses of naloxone — which essentially reverses the effect of an overdose — but insurance companies in the state don’t cover the amount needed, Cuomo said. ​"The insurance companies, in their great wisdom, would not cover the dosage for fentanyl," Cuomo said. "I'm not going to let young people die because an insurance company wants additional profit and doesn't want to cover the dosage for fentanyl." Cuomo also announced a new state regulation that stops insurers from putting a limit on the doses of naloxone residents can buy and a yearly limit on the amount of unused prescriptions they can fill. New York has been in the grips of an opioid epidemic for more than a decade with more than 2,900 people dying from overdoses statewide last year. Last year, 1,374 died from overdoses in the city alone, a 46 percent increase from 2015, with Staten Island and The Bronx hit the hardest. Staten Island had the highest per capita rate of overdoses in the city, with The Bronx having the largest number of deaths. Officials blamed the increase on the introduction of fentanyl which was found in 44 percent of all overdose cases.